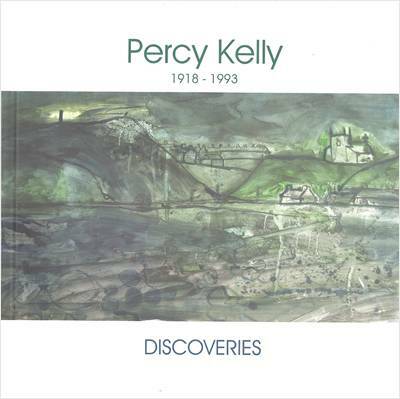 Workington is not a tourist destination, nor is it Utopia but it is important as the town where Percy Kelly was born and grew up. This visit helps us understand him and his work. This trail tells the story of Kelly’s childhood. He lived in the centre of town until he was 10 in an area of grey depressing streets. There were 3 adults and 7 children crammed into the little terraced house. The harbour and docks were just a short walk away - a wonderland to a child. The trail emphasises the contrast. This is the shortest and easiest of the six trails. 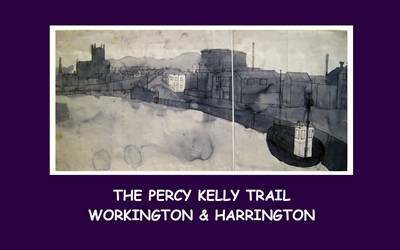 You will spend time at the harbour in Workington where Kelly did his first drawings and walk past his home in Corporation Road and first school a little further along. It is easy to imagine him as a small child marching down to the harbour with a pencil and paper – often just a bit of cardboard packaging. You can see him toddling off to school with his twin brother John. 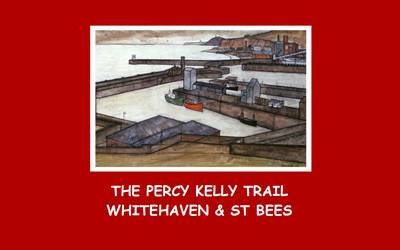 Whitehaven always held an interest for Kelly. It had all the elements that attracted him. Although he was charming, sociable and got on well with people he wasn’t interested in them as far as art was concerned. The human stories of smuggling, invasion and kidnap didn’t interest him. Mines, factories, docks, buildings, cars and railways fascinated him. Parton is a hidden village. It crouches between the shore, the railway and steep cliffs. It can’t be seen from any of the roads into Whitehaven and has been overshadowed by that town over centuries. 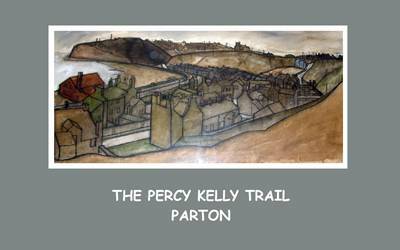 Percy Kelly was painting and drawing here from the fifties when he returned from war service and was reluctantly directed back into working for the Royal Mail and given more responsibility. This left him little time for art so he became depressed and eventually resigned taking over a sub post office and general store at Great Broughton leaving his wife Audrey to do most of the work while he escaped to paint. This was a time of huge development in his work and we see here the difference between the early watercolours and the growing confidence and bold, steady lines of sixties work. It is easy to see why Kelly would find Parton attractive. The curve of the railway, the juxtaposition of the higgledy piggledy houses and the sinister church and Hall silhouetted on the skyline were suited to his style, palate and mood. Whitehaven is the largest town on the Kelly trails. There is a lot to see and do so it is divided it into two trails - first the harbour and town, an easy walk on the flat apart from one hill at the beginning, the other the mining area on the South cliffs and themore arduous coastal walk to St Bees (6 miles). It is easy to spend several hours walking round the Harbour and even longer exploring the town. 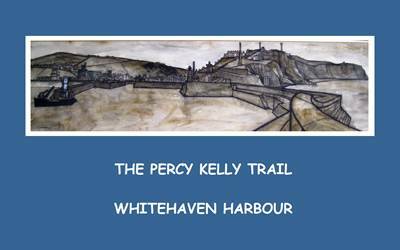 If Kelly were to return today he would be surprised at the tourist development and the amount of public art and number of heritage trails in this town. This makes the work he did here even more interesting - even his rough sketches. By 1730 Whitehaven had the deepest seams, the latest technology and steam engines for drainage and haulage. In 300 years 70 pits were sunk in the Whitehaven area and 500 people - men and boys lost their lives under land and sea. It provided Kelly with unlimited inspiration feeding his love of ships, harbours, machinery, industry and architecture. 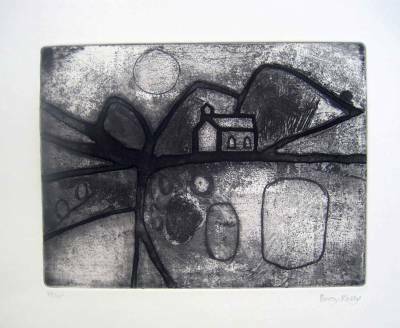 Hand printed from Kelly's etching plate.